A series of designated bike routes have been established in downtown Spokane and are seeing increasing use. Some of the routes are marked with separate bike lanes, such as the Howard Street corridor. The Spokane Regional Transportation Council offers an online map at srtc.maps.arcgis.com/home/index.html. Also, Spokane County’s commuter trip reduction program provides printed maps to employees through their work places and at special events. He said downtown is conducive to bike traffic since vehicle speeds are generally slower than other parts of the city and region. In the downtown area, designated bike lanes are found on Spokane Falls Boulevard, segments of Main Avenue, Howard Street, Jefferson Street, a small segment of Lincoln Street, West Riverside Avenue, Bernard Avenue, Second Avenue, Third Avenue and Fourth Avenue. The University District also has bike lanes. Shared lanes that have markings are on Sprague, First, Second and Third avenues. 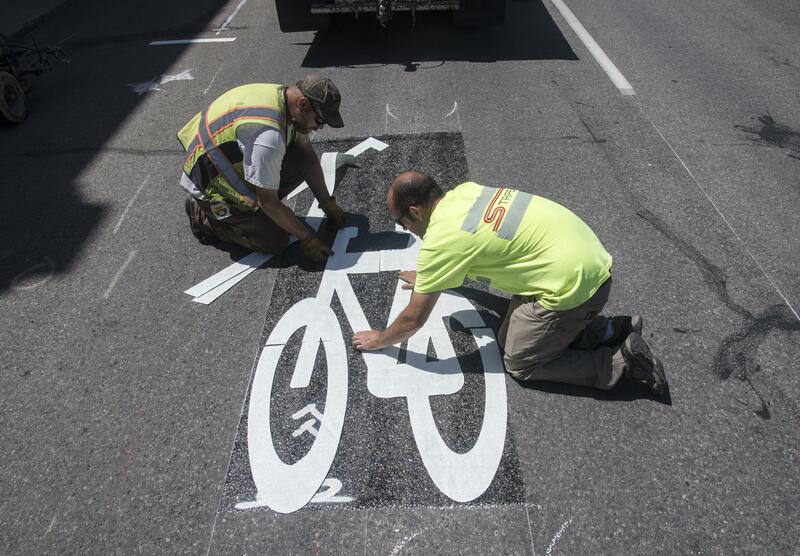 New markings were placed on Sprague and First avenues and Bernard and Sherman streets in early June in a multi-year effort to implement a bike master plan. The bike network on downtown streets is complemented by an expanding network of interconnected trails. The Centennial Trail provides the backbone of the network. One of the largest additions is the trail connection from the Ben Burr Trail in Liberty Lake to the University District. A connection on Martin Luther King Jr. Way is close to completion and opening. Bicycle planning includes discussion of improved bicycle parking and a bicycle sharing program, Blankenagel said. Construction in Riverfront Park has caused detours for the trail there. Bikes are prohibited on Interstate 90 through downtown and the northern end of U.S. Highway 195. Bicycles are also prohibited on sidewalks in the downtown area, but the rule is rarely enforced. Bikes can be a hazard to pedestrians, especially those exiting buildings.